• Or No Occasion At All! Lose TEN POUNDS Without Dieting! 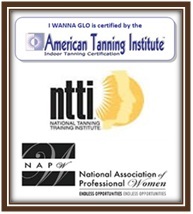 Our clients say they look and feel 10 pounds lighter with their Custom Spray Tan by I WANNA GLO! Click here for our New Client Offer - GLO for only $15 and find out how to GLO for FREE! What Are The Dangers Of Using Tanning Beds?